RICHARD SABLE FROM TAMPA, FL: Bob, you said it would be foolish to look five-six years out for Ben’s replacement. It sure worked out for Green Bay. Tom Brady seemed to work out pretty well, also. BOB LABRIOLA: When the Packers made Aaron Rodgers their first-round pick in 2005, Brett Favre was not coming off his best NFL regular season, as is the case with Ben Roethlisberger. Just to refresh your memory, in 2014 Roethlisberger put together a season in which he finished No. 4 in attempts, No. 3 in completions, No. 3 in completion percentage, tied-for-No. 1 in yards, No. 3 in average gain, No. 7 in touchdowns, No. 4 in interception percentage, and No. 3 in passer rating, and no other quarterback in the league ranked in the top 10 in each of those categories. In the three seasons from 2002-04, Favre threw 54 interceptions, which indicated to Packers management that he was in rapid decline, and that’s why they made the move to pick Rodgers. The Patriots didn’t pick Tom Brady on the sixth-round in 2000 thinking he was their quarterback of the future, because if Bill Belichick had ANY IDEA Tom Brady was going to turn out the way he did, there’s no way he waits until the sixth round to pick him. That was luck, pure and simple, and understand that there’s nothing wrong with being lucky. And even with all that, Rodgers was in the starting lineup three years after being drafted, and Brady two years after being drafted. That’s hardly five-six years out, as you yourself state. If you want to waste a draft pick looking for Roethlisberger’s successor now, go ahead. I’m using the pick on a player I hope can help him win me another trophy. SHAWN SMITH FROM CONNEAUTVILLE, PA: Do you think the media, outside of Pittsburgh, will ever consider Ben the elite quarterback he is? Or will they go on ignoring the records he makes? 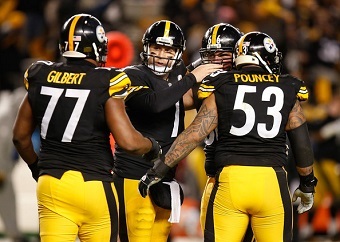 BOB LABRIOLA: I cannot answer for those in the national media, but in my mind Ben Roethlisberger ranks in the top three in the NFL right now, along with Tom Brady and Aaron Rodgers. Peyton Manning is in serious decline; Eli Manning throws way too many interceptions; Andrew Luck hasn’t done enough for long enough yet; Drew Brees is very good, but I’d still rather have Roethlisberger; and I don’t even want to hear about Tony Romo, or Philip Rivers, or Joe Flacco. And who cares what the talking heads on ESPN think, anyway. You can read the rest of Mr. Labriola’s column here.